Public bicycles provide an excellent facility for people to use bikes for local trips. Sharing bikes at convenient locations provides us with an environmentally friendly means of travel in and around cities. Such schemes operate in dozens of cities around the world using different models. Riders pay for daily, weekly or yearly memberships, or use a credit card. They take a bike from one station and leave it at another near their destination. In almost all schemes, the first half-hour is free and the half hour after that costs about $1. The most popular model is the JCDecaux type, where an advertising company runs the system in exchange for access to city-owned outdoor advertising spaces. In other schemes, riders have codes to unlock bikes texted to their phones or register online. Melbourne will soon have a Paris-style network of cheap public bike hire stations in the inner city, with the State Government committing $5 million to the scheme in Tuesday's budget. The network will supply 600 bikes for hire at 50 docking stations, including Parliament House, Federation Square, Southern Cross Station and Melbourne University. The scheme is due to start in 2010. Brisbane will be the first Australian city with a public bike hire scheme. It signed a 20-year contract with JCDecaux in January and hopes to have its network running by next March. A swipe card will cost $55 a year, $25 a quarter, or $10 a day; the first half-hour will attract no extra costs. 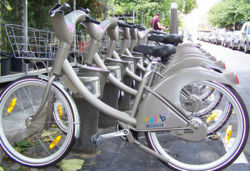 The world's most successful public bike hire scheme is Paris' Velib network, which has 20,000 bikes and 1450 stations. Since it began in July 2007, the Velib has been used 42 million times. However, of the initial 15,000 Paris bikes, 7800 went missing. Bikes were reportedly found hanging from lamp posts and in the River Seine. Some were spotted in Africa. Under the Paris scheme, to fight theft and vandalism, riders' credit cards have about $270 held as a deposit. Bikes are often heavy and look unattractive, and newer models are harder to steal. Montreal's BIXI bikes, one of Time magazine's 50 best inventions of 2008, have radio frequency identification so they are easily tracked. BIXI stations are web-enabled, solar powered and portable. The town of Zug provides bicycles to people who leave a form of identification (such as a passport) to people, who can use the bike for the day. The bikes are maintained by volunteers and under a bicycle maintenance training scheme for young people. Stuttgart in Germany has an effective and well-used public bike scheme. A good option could be to put sections of existing rail and tram networks underground and put linear parks, bike transit routes and some commercial, residential and recreational facilities in their place. This page was last modified 12:37, 7 February 2011. This page has been accessed 14,048 times.